Veyron serial Motor Driver is the latest intelligent motor driver devices produced by DFRobot,including Brush DC motor driver,Brushless DC Motor Driver and stepper motor drives. 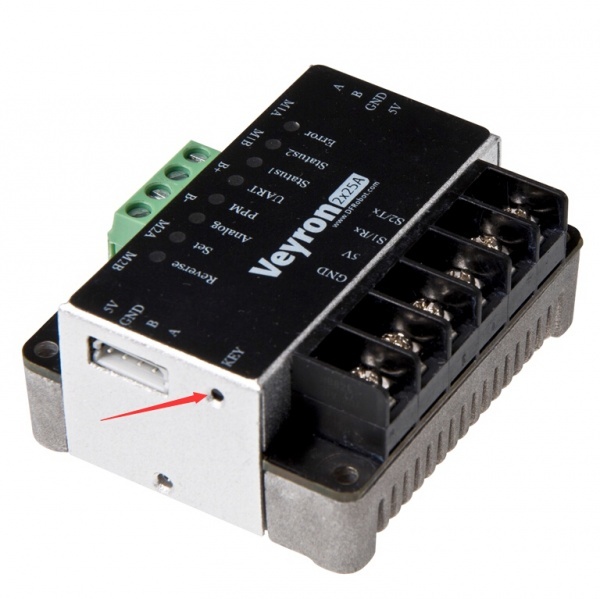 The Veyron 2x25A is Brush DC motor driver which contains intelligent interface mode:Analog,PPM as well as UART(TTL) interfaces; Under-voltage,over-voltage,under-current,over-current,over-heating,shorted, reverse voltage protection; Easy to use: Interface choose with one button, open/closed loop system auto recognition, PID parameter self-tuning, etc. It simplify the manufacture to the user. Serial port here means Arduino Serial which only accept TTL data instead of RS232/RS485. 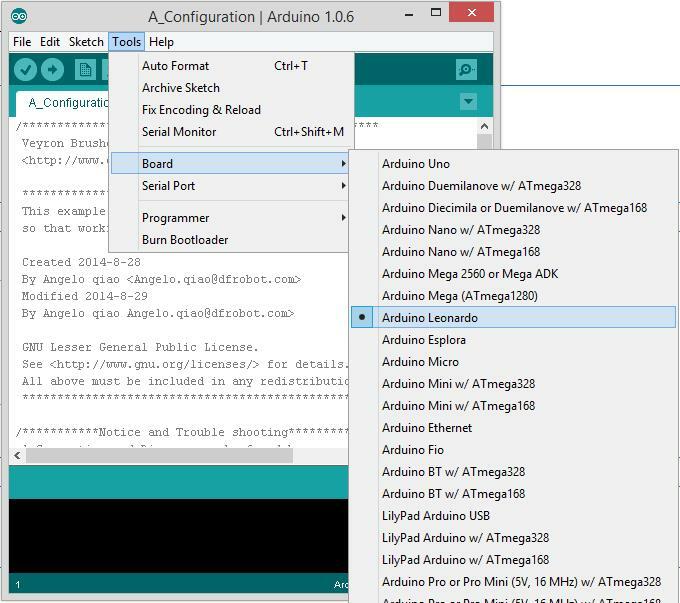 To use the Serial communication feature, you need to have an Arduino card or a FTDI adapetr. Radiator fan contains 2 PIN, they are 5V power output and driver’s controllable connected logical ground. Cooling fan can be directly connected to 5V ( max current 500mA ), or high-power fun controlindicator through Relay. Drive mode can be adjusted by pressing the key, choosing between Set, Analog, PPM, UART( four modes ), the lighting LED indicates corresponding operating mode. In the process of Mode switch ,the drive will reset to new mode only if the internal saved mode doesn’t match the current mode . Analog (two-channel analog voltage signal input): voltage range 0-5V (usually connected with an external potentiometer, if possible , it is recommended that user could add a voltage follower at teh analog voltage output ; or use the PWM+ filter circuit for voltage output). PPM (two PWM signal input): signal sources can be generated directly by a model remote control receiver , or using what generated by the single-chip microcomputer itself. UART: supports 10 commonly used baud rate, compatible with both 3.3V and 5V systems. Open-loop speed control mode: this mode applies to motor control without encoder, motor speed is based on qualitative control . Closed-loop speed control mode: this mode applies to the encoder motor control, by setting the UART interface encoder and reducer parameters to achieve closed-loop speed control. Reverse power protection, when power is reversal connected, power supply reverse polarity indicator light up(Reverse), indicating source of failure. Undervoltage and overvoltage protection for Settable threshold, if the input voltage exceeds the set range, the fault led (Error) is on, the drive goes into fault mode. Settable the maximum permissible continuous current protection. Actual current is greater than the maximum permissible continuous current, and less than the maximum permissible peak current, allowing for 2s, if more than 2s, fault led (Error) is on, the drive will go into fault mode. Settable the maximum permissible peak current protection. Actual current is greater than the maximum permissible peak current, allowing for 400ms, if over 400ms, fault led (Error) is on, the drive goes into fault mode. Settable the maximum allowable temperature protection. Monitor drive’s temperature, if it was less than the limit temperature when temperature is above 40 ℃, the drive automatically output 5V power to thermal interface until the temperature dropped below 35 ℃. When the internal temperature exceeds the set limit temperature, fault led (Error) is on, the drive goes into fault mode. In PPM and UART mode, through the "SSM" directive, setting the control signal mode,to set the drive in discontinuous mode, if within the specified time without a valid control signal, fault led (Error) is on, the drive will go into fault mode. Drive can run in one-way or two-way control mode. In single direction control mode, through "SSD" ,the 0-signal detection instruction,to start zero signal detection of the drive, after restarting the drive, if the original signal is not zero (that is, zero speed signal), the drive will stop,it cannot enter into normal mode until the control signal turns into zero. 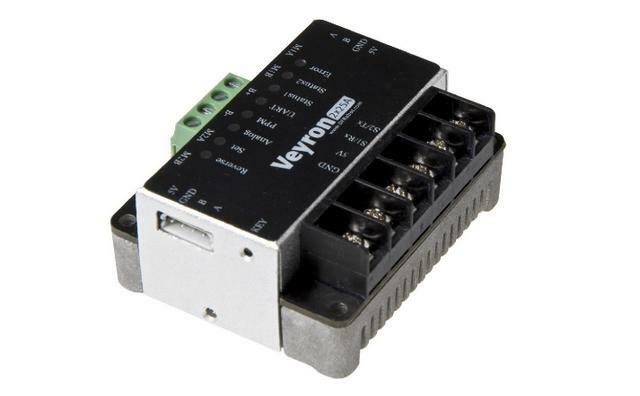 Here, some examples are showed for users to start to use the Veyron 2*25A step by step. You can do more than this with checking the 3rd part: Directive. It is the easiest way to run the motor in Analog Mode. Even you haven't connect the analog signal to Veyron, the motor could run once you set the Veyron in Analog Mode, actually, it regard this situation as input votage signal as 0V.And if need to control the speed, the only step needed to do is to connect a 0-5V analog signal to S1/S2 as controlling signal, the speed is adjusted according to the absolute value of input Voltage, and it would stop if the valtage is 2.5V. If you need to set some paramenters to contorl the motor more precisely, you could do as follow. Wire up all devices as follow picture. 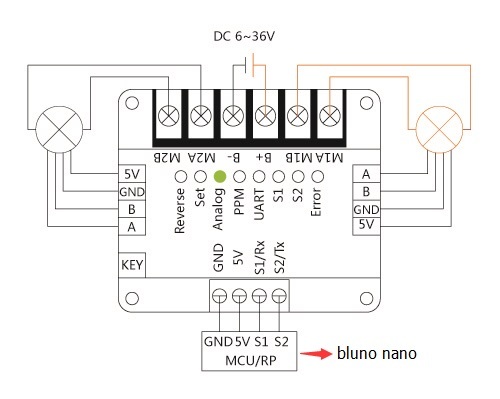 NOTE:The Arrow in the picture(Bluno nano) is available when you need to set some paramenters, but when you need to control the motors(M1/M2), the S1/S2 interfaces are for the signal input. On Veyron, there is a button named KEY.Use something to press it, so you can switch the working mode from UART to SET Mode. After that, Veyron will set PID paramenters automatically.If you want to set the PID paramenters by yourself, you can set them with Instructions in UART mode. Power on, open Arduino IDE, choose the correspond "Board" and "Serial Port", then open the Serial Monitor and set Newline/ Both NL&CR and 57600 bps. More clear steps on Forum. Send “1,SER,13,1”，to set the Ecoder Resolution of M1/M2 as 13/1; Send “1,SGR,51.00,1.00”，to set the Gear Ratio of M1/M2 as 51.00 and 1.00; Send “1,RCONFIG” again, to confirm the modified paramenters. 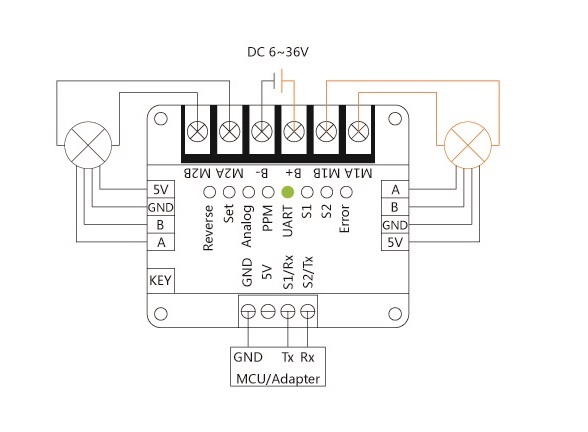 Connect the 0-5V control signal to interface S1, and go into Analog Mode.The motor will run according to the input signal. PPM interface, a very important parameter is PPM extreme, there are two species way to set it.First, send instruction through UART interface; second, it is in Set set mode, while led Status1 and Status2 flashing, user using remote control model put the corresponding bar in its extreme location respectively stays about 3 seconds, the drive will automatically recognize threshold value. In this process, if S1 and S2 have already hold right PWM input, Drive will calculate reliable limits according to the signals, if there is only one correct PWM input, then the drive will use this signal as an final limit values. Certainly, you can also send PWM signals of the two limit positions through AVR, regardless of which method you use, PPM limit value shall not exceed the scope 500us-2500us. Since the use of PPM interface, any other configuration parameters can be set directly apart from PPM extreme, if you do need to set up the relevant parameters, you must configure them using UART interface. All the fault messages, it should be checked with above 1.10 table in Protection. 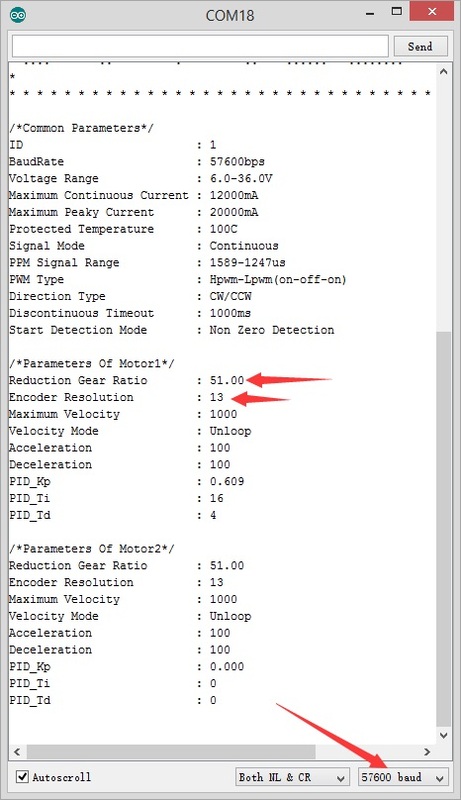 In addition, both in open-loop or closed-loop control mode, the relationship between PPM signal and motor speed are described as the figure below (Note: when the signal is below the minimum limit value or above the maximum limit value, the drive will not respond). In this example, the PPM signal is created by a program, you could copy that from this passage below into Arduino IDE. Note: If you need to set or read some parameters, please refer to the “In Analog Mode”. On Veyron, there is a button named KEY. Use something to press it, so you can switch the working mode into SET Mode. After that, wait for a while. Veyron will set PID parameters automatically.If you want to set the PID parameters by yourself, you can set them with Directives in UART mode. co-rotating for 5 seconds ---stop for 5 seconds---reverse running for 5 seconds. It will loop this.Try to change some parameters to contorl the motor. delay(5000);                     //the motors running for 5 seconds. Here, in UART mode. There are two things you can do. First one is very useful: to set some parameters and read what’s inside of Veyron. Second, you could control the motor by a program in the interface. Ready? So, let’s get start. 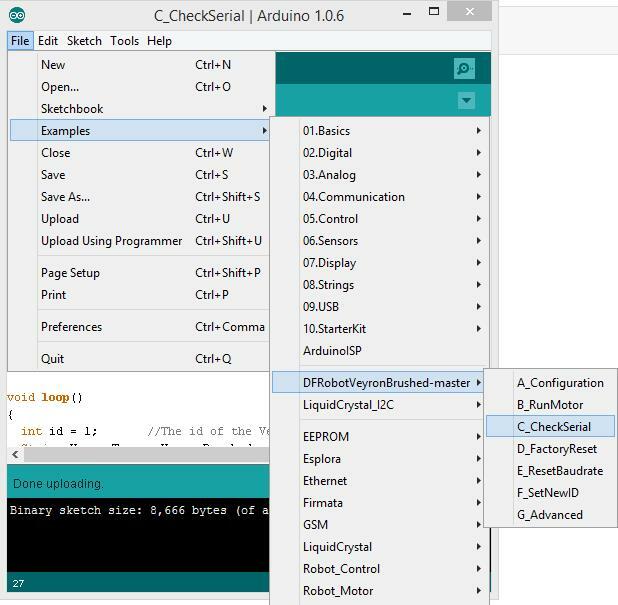 Then, open Arduino IDE, you could find the needed program. 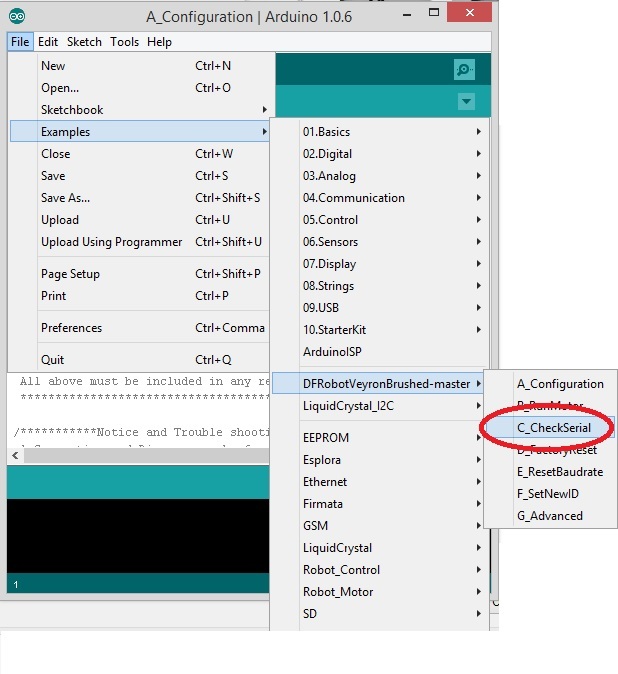 Open the “C_CheckSerial”, and upload it to the Leonardo. Then open the Port Window. If you receive the “BDC, Connection Good! ”, then you can go on. If not, check the wire or other steps. Upload the “A_Configuration ” This step is to set some parameters ”encoder line” and ”gear ratio”, you can find them in the program. Upload the“B_RunMotor” Once you upload the example, the motor will run in this way: co-rotating for 2 seconds ---stop for 2 seconds---reverse running for 2 seconds--- stop for 2 seconds. It will loop this. 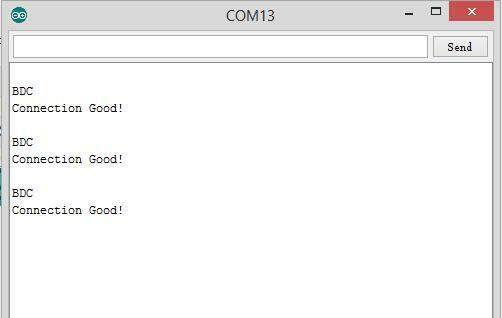 NOTE: How to send these commands to Veyron? Read on Forum. This version's instruction set system, a total of 44 instructions, does not distinguish between uppercase and lowercase, all instructions, whether were sent or returned, there will be "Enter + line feed (\r\n)" as a command terminator. All system parameters can be grouped into the Immediate variable parameter and non-immediate parameters, these parameters will be saved (EEPROM) when return in response to "read drive configuration parameters" command even if off power, the remaining parameters will lost (RAM). Immediate variable parameter is that user setting takes effect immediately (Note: need to perform "EEPSAV" to saves all present configuration parameters in order to ensure those will not lost if power off), including each motor’s acceleration/deceleration, PID parameters asynchronously and synchronous speed (Note: asynchronous and synchronous speed are in detail below). Non-Immediate variable parameter refers to what have set to be only saved in the EEPROM ,after the system was reset, it can take effect. Query drive type (ID,PING\r\n) The type of Veyron motor drive series can be accessed through this command, such as: send the order to brush DC motor drive, returns "BDC\r\n". Read the drive configuration parameters (ID,RCONFIG\r\n) Through this directive, will get all the configuration parameters of the drive, after you set the parameters, you can query parameters whether have been changed according to the requirements with this directive, if it has been changed, and it had to be saved in the EEPROM, it’s available to use "save all current configuration parameter" command mentioned bellow, then the parameters can be saved. Restore factory settings (ID,FCONFIG\r\n) All configuration parameters restore to factory settings with this command, drive will automatically reset once receiving the instruction and allow the configure to factory parameters. 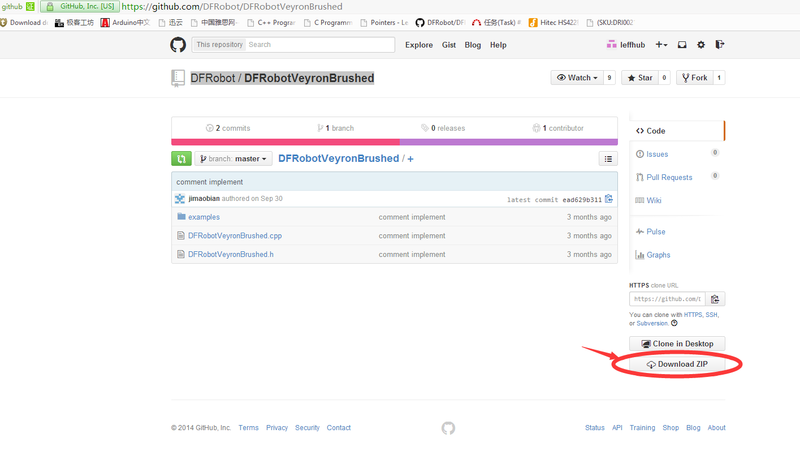 Query Help (ID,HELP\r\n) The instruction help you get the wiki address of DFRobot products, user can search the drive models on this page, then can get corresponding document. Save all the configuration parameters (ID,EEPSAV\r\n) By the instructions to save the current configuration parameters, before saving, it’s better to use the "read drive configuration parameter" command to confirm whether the current configuration parameters are setting values, drive will automatically reset once receiving the instruction and allow the configure to factory parameters. Set reduction ratio (ID,SGR,****,####\r\n) Two motors’ gearbox reduction ratio can be set with the instruction (M1/M2), actual controlling and output speed is the actual load speed. Users may set this to 1 to get the really true speed of motor. In addition, the drive supports decimal reduction ratio, accurate to 2 decimal digits. The factory default value is 1. Set direction mode (ID,SDIR,*\r\n) In most applications, the motor is sometimes required to run in clockwise, but sometimes counterclockwise, we call it as bidirectional control mode. However, in a number of engineering applications, it only rotates in one direction, we call it one-way control mode. In fact these modes are same in the UART interface, but in PPM and Analog mode is rather different, on the one hand it is prone to human manipulation errors, on the other hand the precision of the input signal is reduced by half. This drive can be easily set to one type of orientation mode: configuration parameter of 0 indicates a one-way mode, 1 indicates a two-way control mode. The configuration parameters are valid only in Analog mode and PPM, the factory default value is 1. Set zero signal detection or not when start (ID,SSD,*\r\n) Only in the PPM or Analog interface mode, and the direction mode is one-way,the zero signal detection when start is available to set. For most of one-way control mode applications, there are more stringent security requirements, such as in PPM or Analog interface mode, because these modes without acceleration/deceleration feature are servo-controlled, System suddenly reset causes violent impact to load, when the motor holds dangerous loads, it will be a threat to personal safety. In this case, you can start the zero signal detection to enhance security. When system suddenly reset motor at rest, only after the control signals is near to stop before they can engage in normal controls. Configuration parameter of 0 indicates to disable the zero signal detection, of 1 means enable zero-signal detection, the factory default value is 0. Set asynchronous speed (ID,SVR,*,*****\r\n) Synchronous speed refers to the speed once you have set, the drive will Not immediately regulate motor speed according to the parameters, only when it receives command-Perform asynchronous speed before it can take effect. If need simultaneous control of multiple motors, by setting asynchronous motor speed to each motor, and then sent by radio to perform asynchronous speed commands. Get the PPM Max (ID,GPA\r\n) PPM Max factory default value is 2500us. Get the minimum PPM (ID,GPI\r\n) PPM minimum factory default value is 500us. Get the control signal mode (ID,GSM\r\n) Drive control signal patterns into the sustainable mode and discontinuous mode, sustainable mode refers to drive will keep the parameters set before once it received a valid control signal,it will changed until it receives new parameters. Discontinuous mode is that the drive will stop working once valid control signal is not received within a stipulated time, and indicates a failure of losing signal(a specific time, please refer to "set a break mode time limit" directive). In addition, the control signal mode is valid only for PPM and UART interfaces. Return parameter of 0 indicates that continuous mode and 1 indicates a break mode, the factory default value is 0. To get the maximum permissible continuous current (ID,GMCC\r\n) Actual current is greater than the maximum permissible continuous current, and less than the maximum permissible peak current, allowing time for 2s, larger than the 2s, the motor will stop automatically and indicates overcurrent fault, factory default is 25000, unit- mA. To get the maximum permissible peak current (ID,GMPC\r\n) Actual current is greater than the maximum permissible peak current, allowing over 400ms, greater than 400ms, the motor will stop automatically, and indicating over current fault, the factory default value is 30000, mA. To get the maximum allowed temperature (ID,GMT\r\n) Drive temperature measuring range:-10~100℃, resolution of 1 degree Celsius. To get the current temperature (ID,GCT\r\n) If the current temperature is greater than 40 ° c, fan drive interface will output 5V/500mA power, user can add-in a 5V fan or relay control power fan, to cool the drive off, when the temperature drops below 35 degrees Celsius, power supply will be disconnected. If there is no cooling measures or do not work, when the internal temperature is higher than the maximum allowable temperature, the motor stops, and also indicates over- temperature fault. To get the system voltage (ID,GSV\r\n) If when the system voltage exceeds the limit voltage range, the motor will stop and then indicates the undervoltage or overvoltage fault. Control Signal Lost: (1,GER\r\n) when the control mode is a break mode, the host controller is required to send control commands within a set time, if there is no control signal for a set time, drive will consider control signals as lost. Clear all fault messages (ID,CER\r\n) After the failure, the drive goes into protection mode, the motor will not be able to drive. In the UART interface, it can be in normal mode by clearing the fault information; in the PPM and Analog interfaces, resupply power, reset drive, shall enter into the normal mode. '''Q1. ''' Comman wiring mistakes might cause unexpected problem, like: The motor is not response to the command or signal, or the motor can not rotate continuously. You can check if you made some mistake in the list below. Bad/ loose connection. That is some bad wire or wrong connection. One possible wrong connection is happened on the connecter, showing as the picture at right. Tx and Rx connected wrong. 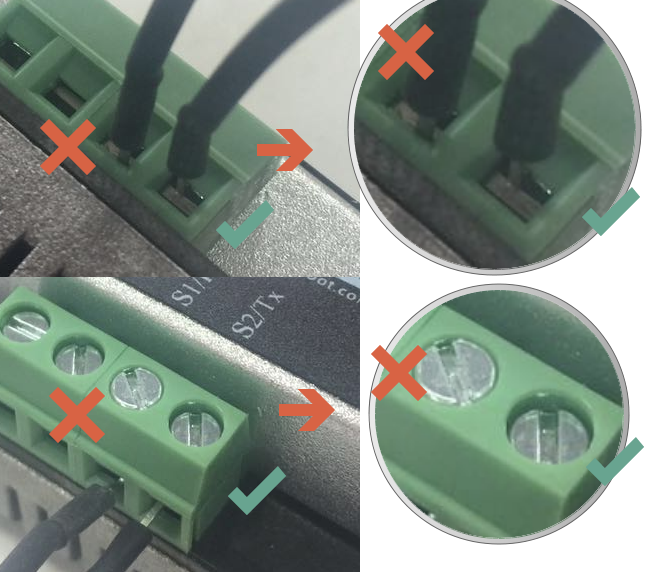 Generally, the connection should be Tx-Rx, Rx-Tx (Device A - Device B), but some product is designed for special purpose that the lable Tx on PCB is Rx actually, if so, you would better check its schematic to see if it's ture and exchange the Tx, Rx connection. If you connect the wires + and - of power supply in reverse way. '''Q2. ''' 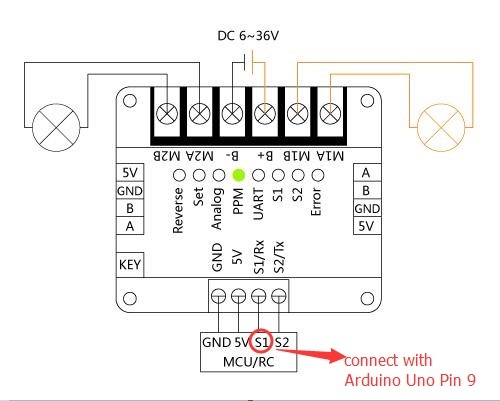 I sent command by Arduino serial monitor through serial port (TTL 5V), but nothing happened, how should I do? Only one green LED for UART is ON which means you are in UART mode. 5V 5V If Veyron has been powered by B+ & B-, this is not needed any more.